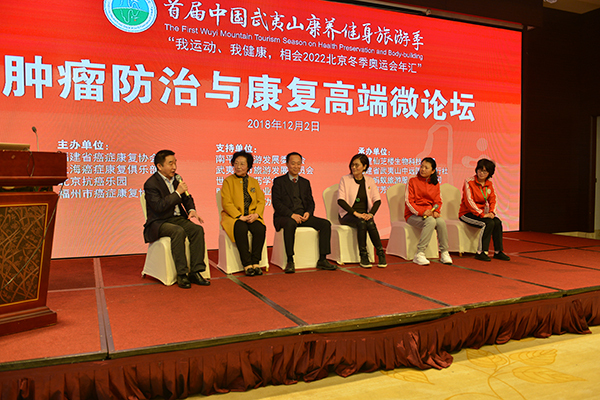 On the morning of December 2, the National High-end Micro-Forum on Cancer Prevention and Rehabilitation kicked off in Wuyishan. The forum is one of the activities of the first Wuyi Mountain Tourism Season on Health Preservation and Bodybuilding in China. The event invited Professor Yuan Zhengping, Deputy Director of the Rehabilitation Association of China Anti-Cancer Association, and Professor Xu Kecheng, President of Guangzhou Fuda Cancer Hospital, and a dozen experts in the field of cancer treatment and rehabilitation to come to the scene to report on the latest research results of cancer prevention and treatment. In the subsequent micro-forum, doctor-patient exchanges were held, and more than 70 representatives from cancer rehabilitation associations across the country answered questions and guided the patients to receive correct treatment and develop good habits to overcome cancer. Anti-cancer stars have also come on stage to share their own anti-cancer experiences. As the organizer of the event, Fujian GANOHERB Biotech Group brought to the national cancer friends Ganoderma Lucidum known as [Magic Herb", which was welcomed by all the people at the venue. "Ganoderma lucidum is rich in active compounds such as Ganoderma lucidum total triterpenes and Ganoderma lucidum polysaccharides. Modern studies have shown that these active substances have the effect of inhibiting tumor cell proliferation, invasion, metastasis and improving immunity." Professor Yao Weixi, Chief scientist of GANOHERB, came on stage and introduced, "We hope to use modern technology to extract the essence of the millennium grass, and bring hope and health to our friends. I hope that everyone will be as good as Ganoderma in the future, and life will be extended!" The audience applauded warmly. For a long time, GANOHERB has actively assumed the mission of a large enterprise in the health industry and is keen on public welfare undertakings such as cancer rehabilitation. Since 2009, GANOHERB has been fighting alongside anti-cancer associations for ten consecutive years to help patients and their families, popularize the knowledge of prevention and treatment and promote rehabilitation undertakings. GANOHERB celebrated [five-year birthdays" for cancer patients in Fuzhou each year, sponsored oncology conferences in Hebei and other places, held new-year banquets for cancer patients in Beijing and Nanjing, and helped Shanghang Cancer patients in the poverty-stricken areas with China Cancer Foundation in 2015. During the anti-cancer week in 2018, GANOHERB presented millions of loving Lingzhi products to the national cancer patients. From high-quality product development to spiritual and material assistance, GANOHERB closely linked the smooth recovery of cancer patients with corporate development. In the future, GANOHERB will continue to develop for "love" and contribute to "love".